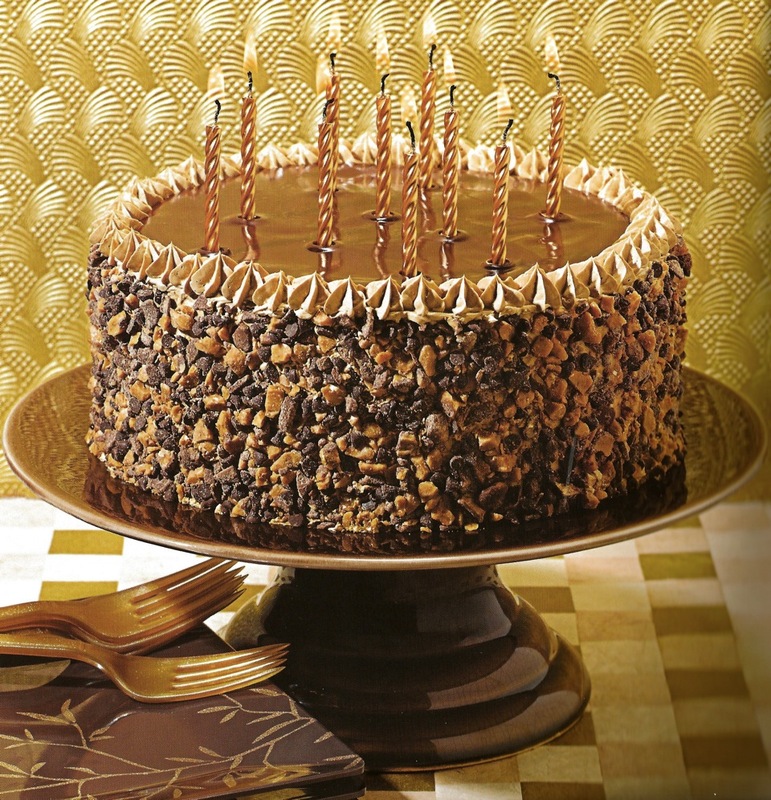 This is a big, important cake, perfect for significant milestone birthdays. Many of the components—the cake, the buttercream, and the ganache – can be made ahead. This cake elicits “ooohhhs and aahhhs” and once guests taste it they will be clamoring for the recipe. My good friend Kerry Boyd requested a cake with these flavors for her fortieth birthday, so it is dedicated to her. Chocolate cake, brushed with optional Kahlua, espresso Italian Meringue Buttercream all encased in a shell of crunchy toffee bits and mini chocolate chips. You can make any kind of border you like around the top outer edge as long as it is solid – you need it to hold in the poured ganache. Have cake layers and buttercream ready to assemble. Brush cake layers with Kahlua. Toss together the toffee bits and morsels in a small bowl; set aside. Fill and frost cake somewhat smoothly with buttercream (make sure cake is on a cardboard round as it will make next step very easy). Press toffee bit/morsel mixture all over sides (you can just pick up the cake on the cardboard and hold over bowl of morsel mixture with one hand, and apply morsel mixture with other hand). Use star tip to make a complete ring of shells or rosettes around top outer edge of cake; it is very important that you make a full ring as it will hold in the ganache that you will be pouring on top later (see photo). Chill cake until buttercream is firm, at least 2 hours. Have ganache fluid, but not hot. Pour it over the center top of the cake and flood the entire top within the boundaries of the decorative frosting rim; a small, offset icing spatula works very well here to help push the ganache up against the border. Chill cake until ganache is firm, at least 2 hours. Bring to room temperature before serving. Cake may be served immediately or refrigerated overnight in covered container.